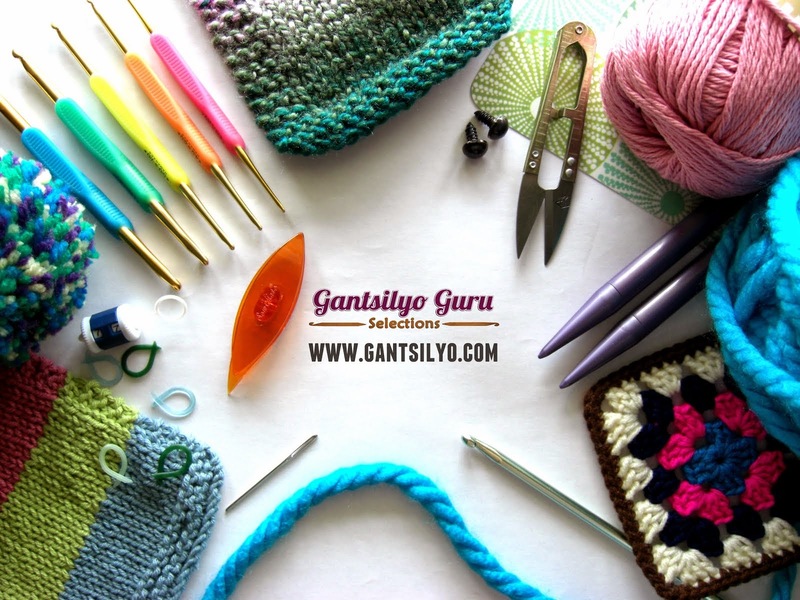 Gantsilyo Guru Baby Cashmere Acrylic is Here! Right off the bat, this is not real cashmere :) But let's just say it comes close enough to the real thing. 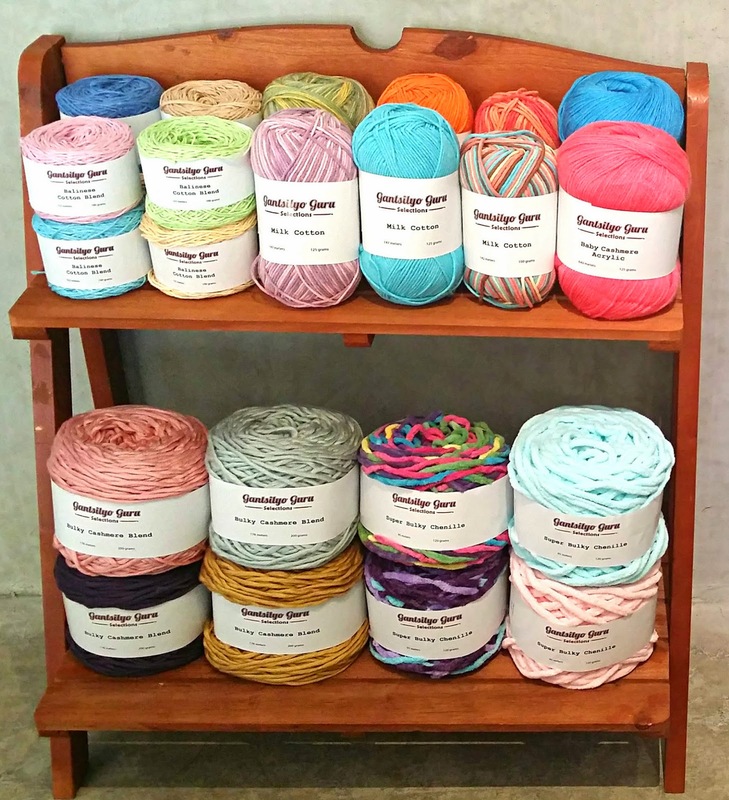 This yarn is made of 100% acrylic that simulates the softness of cashmere. I recommend it for just about anything baby - beanies, blankies, clothes, among other things - well, maybe except shoes because this yarn might be too thin. And no, it's not just for babies! In fact, I crocheted a cowl with it using a 4.0mm hook. This is actually a pattern from Hamanaka (see a previous post about this pattern here). I knew this yarn would be a great choice for this pattern because its lightness complements the design. The result is a lightweight cowl, which doesn't fall short of making you warm enough if you wear it in the mall or in a very cold air-conditioned office. And guess what, I only used 1 skein of this yarn to make this entire cowl! When draped over the neck (once), the cowl reaches up to 25 inches. You can wrap it twice and wear it closer to your neck without choking you. One skein is 640 meters long (125 grams). Thickness is Fine (2) with a recommended crochet hook size range of 3.5 - 4.5mm and knitting needles size range of 3.25 - 3.75mm. Don't be intimidated by the fine thickness of it though. I know it takes more stitches to cover more area, but this yarn is a good choice if you want design and detail to be the highlight of your project. We have an initial batch of 13 colors you can choose from. You can choose from dark ones. And from multicolored ones too. 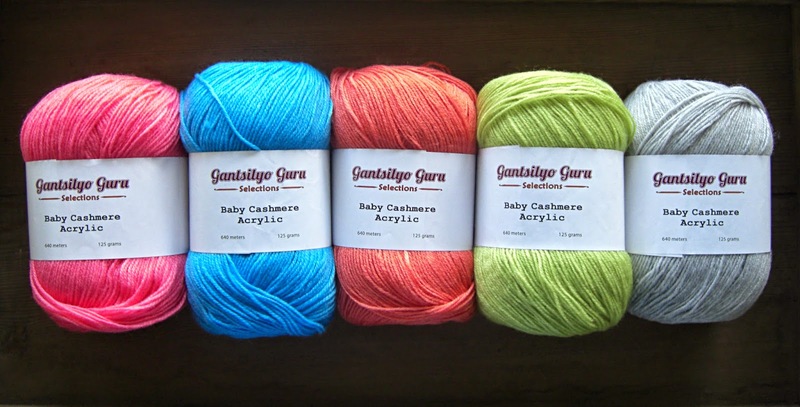 You can buy your skein of Gantsilyo Guru Baby Cashmere Acrylic here at PHP 225.00 per skein. 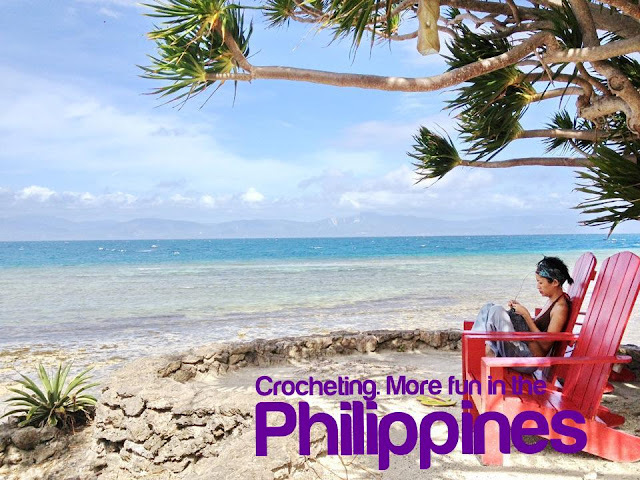 We offer a PHP 20.00 discount per skein if you buy 3 or more of this yarn. Please be informed though that for now, our online store does not automatically compute (yet) this discount, so you would have to wait for another email from us with your final (adjusted) deposit amount with shipping fee. I hope you enjoy working on this yarn as much as I did! Paper Stories Bazaar This November 8! November will be a full month for me for weekend yarn pop-ups and I am excited to announce the first one this month! 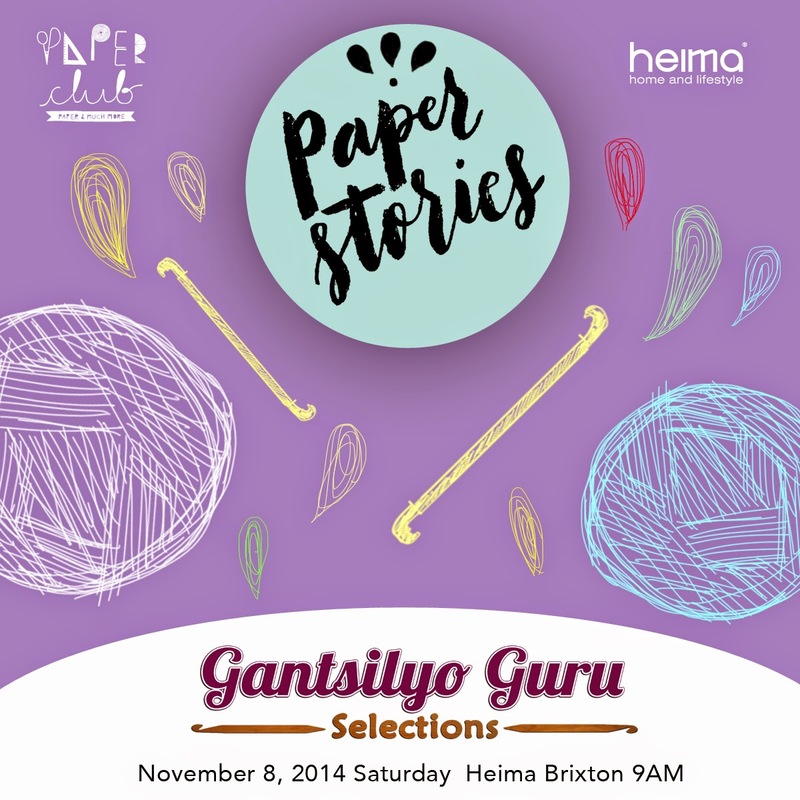 I will be part of the Paper Stories Bazaar by Paper Club at Heima Home and Lifestyle (Pasig) on November 8 (Saturday). Paper Stories is a small independent market for crafts, art, and design. Check out last month's Paper Stories event HERE. 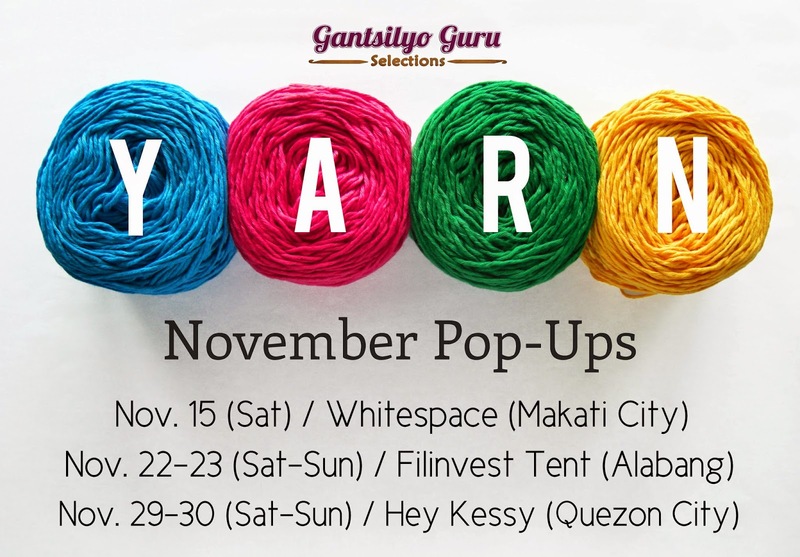 For this pop-up, I will be offering 8 varieties of my very own line of yarn which is still not available online at Gantsilyo Guru Selections. Here's a preview! Not all colors are shown in this picture. Believe me, I have so much more! I am very excited for this initial offer during my pop-ups. Expect online availability of some of them within the month and more stocks and colors to arrive January next year. Heima Home and Lifestyle is located at Unit 103, Three Brixton Bldg., #3 Brixton St., Brgy. Kapitolyo, Pasig City. Bazaar will be open from 9:00 AM to 7:00 PM. If you can't make it this Saturday, I have more pop-ups this November!